Earrings are exposed to more dirt and grime than just about any other piece of jewelry, including rings. Whilst rings come into contact with all sorts of substances all the time, the nature and location of earrings means less of same sort of gloop gets brushed or washed away. 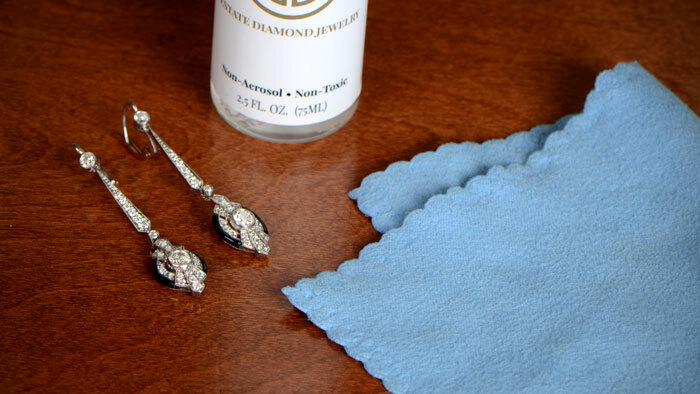 Learn everything that you need to know about cleaning your earrings. The natural oils, plus accumulated creams and other grease and dirt from fingers, shampoos and soaps that we don’t rinse away properly, hair products and more all surround earrings on an almost permanent basis. Plus the design of most earrings make them a haven for tiny particles which build up and (literally) take the shine right off. The difference between earrings that are clean vs. unclean is usually extremely pronounced. The important reason is preventing bacteria and infection. It is important to remember that an earring actually goes into one part of your body and comes out at another. You can wear clip-on earrings, of course, but these are less common in modern times than they once were, with pierced ears very much the norm. Because the earrings are touching your ears means that they are much more prone to infection (than what is likely with rings or necklaces). Failing to clean your earrings regularly can prove to be a very painful and dangerous experience if the ear does become infected. It is very important to note that you should always clean earring posts while trying on them on at the jewelry store. Earrings are usually tried on by so many people at the store and they can often contain a lot of bacteria and dirt. We suggest requesting alcohol pads from the jewelers before trying on a new pair of earrings. Please ensure that you do not do the cleaning techniques on any jewelry containing emeralds or pearls. It may seem incredibly obvious to say this, but wash your hands both before you start and before putting them back in. Your hands will be teeming with bacteria, so why risk transferring that to the exposed hole in your ear? There’s also no point cleaning your earrings and then putting the same dirt and bacteria all over it as you put the pin through the hole again. Although soap and water will clean your hands, and possibly even sanitize them if you use anti-bacterial soap, any cake or even liquid soap can leave a residue which will then be left on the earring and your ear. Better to use an alcohol-based gel which leaves very little residue and leaves your hands fully sterilized. You can buy ready-made cleaning solutions from most jewelry stores and, whilst not especially expensive, there are cheaper methods available to you. By far the simplest cleaning agents that are easily available are rubbing alcohol or hydrogen peroxide. Both are excellent disinfectants, and any excess that doesn’t wash away, quickly evaporates. 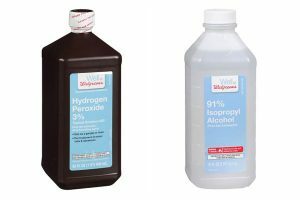 In the case of hydrogen peroxide, it breaks down to a simple water solution when exposed to the air, so there are few potential side-effects or skin reactions likely. The use of gloves is highly recommended, as both liquids can dry the skin of your fingers quite quickly. Do be careful with the level of concentration with hydrogen peroxide, however. When bought in a pharmacy, the concentrate will be at a safe level of 3-6% which is ideal for cleaning jewelry and other items. If you obtain it elsewhere, it may be over 30% concentrate which can cause skin damage and may be fatal if swallowed. How to do a Weekly Cleaning Session? The actual cleaning method is very simple, regardless of your chosen solvent. Just put some of the cleaning solution on a cotton pad (or micro-fiber cloth) and use the pad to clean the various parts of the earrings, including the plastic or metal back which keeps it in place. Ideally, you would do this every day, but this isn’t always practical. Do, though, try and get into the habit of cleaning your worn earrings on a weekly basis to avoid issues that may arise as time goes by. Note: If your ears have been pierced for less than 6 weeks, you shouldn’t remove the earrings. 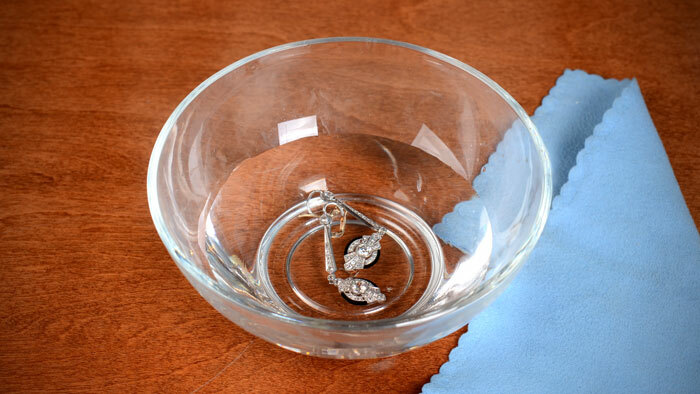 You can use rubbing alcohol to clean the earrings in place, if necessary. For the vast majority of earring styles, the weekly cleaning method will be more than enough to keep your jewelry nice and clean but, if you have earrings with lots of small stones, intricate filigree or fine millegrain, or you haven’t cleaned your earrings in a while, it may require a slightly different approach. Some gemstones, such as diamonds, will easily handle being submerged in alcohol or hydrogen peroxide, with gin also being an excellent cleaning fluid. This will loosen hard to shift dirt which can easily then be wiped away with a cotton pad. Use the method above to get the cleaning solution into any hard to reach places, and then use a soft toothbrush to loosen and clear away ground in dirt and grease. Please ensure that you do not scrub the earrings to hard. You may need to repeat the process two or three times if your earrings are particularly dirty. If you make cleaning a regular activity, then you should only need be perform the process once. 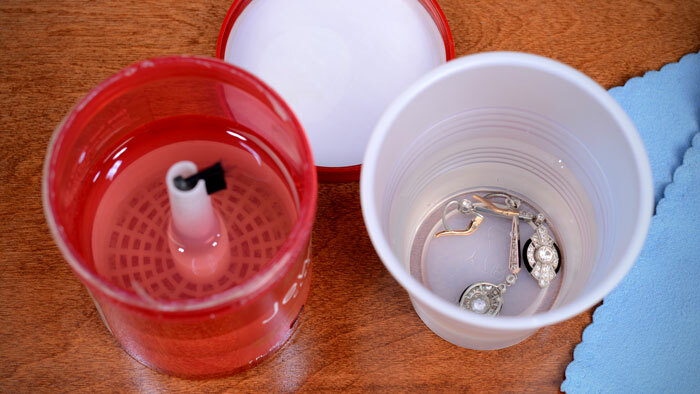 If the earrings are very dirty, you can try the same process, but instead leave the earrings submerged in the cleaning solution for 12 hours. This technique requires you to heat hot water and pour it into a container. You can soak the earrings in the container for 20 minutes, followed by a rigorous cleaning with a soft-bristled toothbrush. Wait until the earrings have reached room temperature and then wash them with warm tap water. Use a blow dryer to dry the clean earrings. 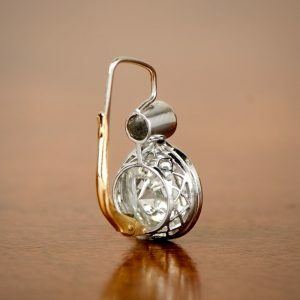 This option may be a little more difficult, but it is without a doubt the best option for someone who has really dirty earrings. Jewelry stores have professional equipment designed to clean your earrings and make it shine like the day it was made. Almost all jewelry stores will clean earrings for free (even if you didn’t purchase the earrings from them) and so there is not really any risk bring the earrings to be cleaned. 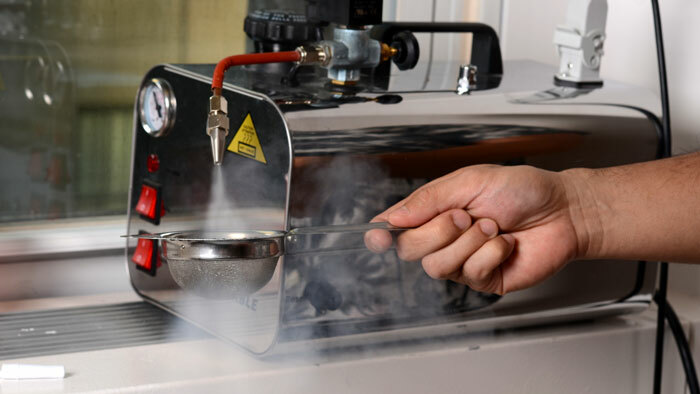 Jewelry stores will typically use ultra-sonic cleaners or steam machines. They will also know which jewelry is safe to go through which cleaning process. Every day, many of us remove contact lenses, wipe away make-up, use skin toners and a hundred other things as part of our daily cleansing routine. Making our ears and earrings a part of that routine is quick and simple, so there’s no excuse for not keeping everything clean and healthy. If you love your earrings and want to explore the beautiful and rare earrings from our collection, click here.